Varjo’s VR headset is as detailed as human vision with a 70 megapixel resolution. The crops you see above are crops from the view with an experimental VR headset from Varjo, comcompared to the Oculus Rift desktop VR system. Simply put, it looks incredible. Varjo’s resolution is 70 megapixels per eye compared to the 1.2 megapixel resolution of the Oculus Rift and HTC Vive. Varjo is a startup formed by former Nokia employees and their goal is to create a headset with as much resolution as human vision will allow. That will require tremendous amounts of data, which they aim to reduce through foveated rendering, which means that it will track your eye, and only the parts that you are looking at will be rendered at full resolution. 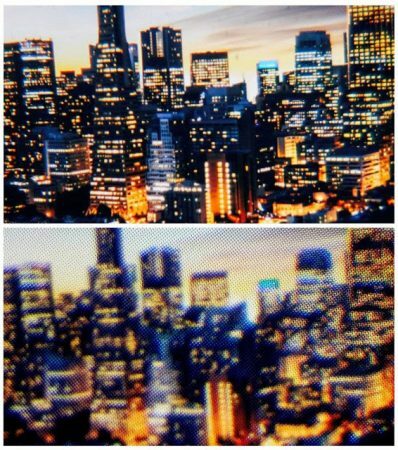 I’m curious how the extremely high resolution affects a viewer’s sense of immersion. Will images become much more convincing? We’ll see. In the meantime, you can check out more samples on Varjo’s official website.